Within the pages of Ronda Moore’s new book, Messenger of God’s Love “Loving the Unlovely”, readers will discover the author’s personal testimony of God’s power and his unconditional love for all. Moore states clearly and simply that Satan is trying everything he can to distract man from God and His kingdom. This book will encourage individuals to turn away from the Devil’s temptations and to seek our their God given gifts so that they may use them toward their role in the Great Commission. 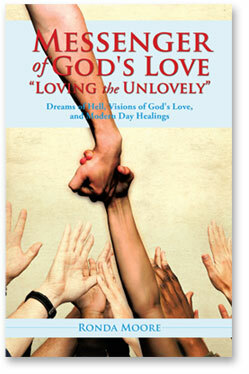 Messenger of God’s Love “Loving the Unlovely”, a personal testimony of God’s power and unconditional love is available for purchase in both paperback and hardcover format. Visit the Order Information page. Copyright © 2019 Ronda Moore.